Well pigs can eat hay but they don’t derive as many calories from it as ruminant animals, such as cows. Pigs require six nutritional components in their diets: water, carbohydrates, fats, protein, minerals and vitamins. After the pigs are weaned from their mothers they eat a complete diet in a pelleted form. They also enjoy rooting around in the woods looking for acorns, grubs and other natural goodies! 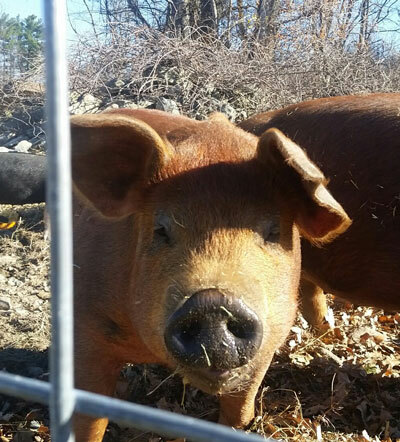 We raise Berkshire and Duroc pigs. Berkshires are known for their black and white markings. They originated from Berkshire County in England and were brought to America in the 1800s. Durocs are a burnt red color and have floppy ears. Both breeds of pigs are known for the juicy, flavorful and tender meat. Click the button to view our packages and pricing. Refer to the handy chart and website below to learn how to identify and cook cuts of pork.